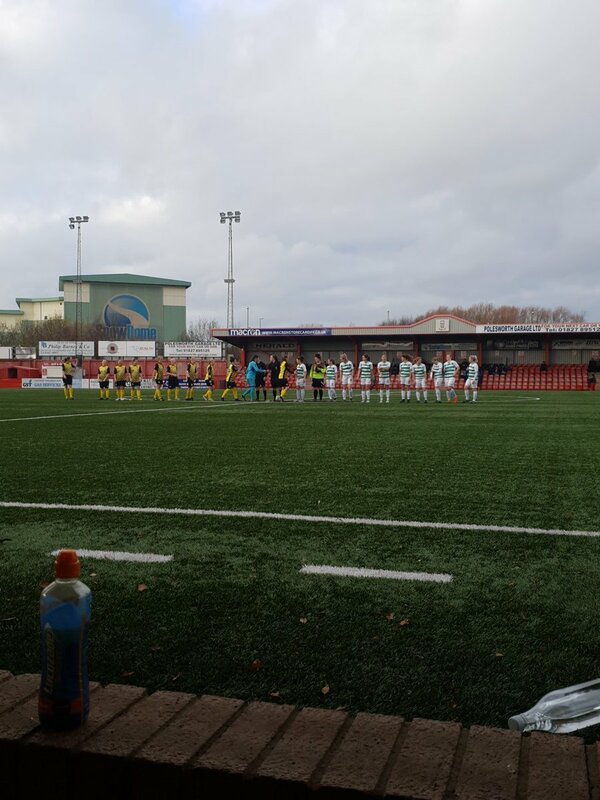 The New Saints Ladies were held to a 2-2 away draw by Burton Albion Ladies in their FA Women’s National League Midlands Division 1 clash at Tamworth FC’s The Lamb Ground on Sunday. Saints had gone into the game on the back of a 0-4 home defeat by Sporting Khalsa in their previous league game on 11th November which had left them in 8th place out of 11 in the table. Meanwhile, Burton had gone into the game on the back of a 2-3 home league defeat by Nettleham Ladies the previous Sunday which had taken their total winless run in all competitions to 11 games dating back to 26th August to leave The Brewers in 9th place, a point behind Saints. Saints took the lead in the 30th minute when Laura Pennington intercepted a pass on the left of middle and sent a low through ball to Emily Ridge, who ran on and into the box before firing her right foot shot from 10 yards into Burton keeper Erica Turner’s left hand corner for her 7th goal of the season in all competitions. It was 2-0 with just 1 second of normal time at the end of the first half when Laura Morris’ low short corner from the right found Ridge inside the right corner of the box who turned before being tripped by Alex Liddiard for what was a clear penalty. Morris stepped up to calmly fire the resulting spot kick into Turner’s right hand corner for her 5th goal of the season in all competitions. Then with exactly 6 completed minutes of the second half played, Burton pulled a goal back when Paris O’Connor’s low through ball down the middle found Jordan Atkin who ran on before firing her right foot shot from 10 yards into Saints keeper Sarah Parkes’ left hand corner, although the keeper did a get a hand to it on its way in. It was 2-2 just into the 59th minute when a Saints ball back to Parkes was closed down by Atkin, Parkes’ attempted clearance hit O’Connor and the ball ran towards the keeper’s right hand corner before O’Connor fired her right foot shot from about a yard into the same corner. In the immediate aftermath of the goal, O’Connor’s attempt to pick the ball up from inside the goal saw her pushed by Parkes who pushed O’Connor back before Saints’ Taylor Davis pushed O’Connor over in retaliation. When order was eventually restored, Leicester referee Natasha Wilson firstly showed a straight red card to Parkes (60) before eventually showing straight red cards to O’Connor (62) and Davis (63) with all three players being dismissed for violent conduct. The total length of stoppage between the goal and the eventual restart was 8 minutes 10 seconds. The incident and subsequent sendings off had spoiled what had otherwise been a good entertaining game. There were no further goals after that and the final blast of referee Wilson’s whistle after a total of 9 minutes and 51 seconds of added time at the end brought the game to a close with both sides having to settle for a point each. Burton: Erica Turner, Amelia Robb, Paris O’Connor, Charlotte Worth, Gina Rushton, Jordan Atkin, Laura McQuilkin, Alex Liddiard, Fiona Lane, Portia Baddach, Hannah Baker. Subs: Charlotte Heggs (GK) (not used), Nina Warrington (for Baker 88), Ellie Milsom (not used), Lauren Greaves (not used). Saints: Sarah Parkes, Phoebe Davies, Lia Lewis, Laura Morris, Taylor Davis, Emily Ridge, Jodie Bragan, Kim Bebbington, Caitlyn Smith, Laura Pennington, Erin Taylor. Subs: Lauren Brown (for Pennington 71), Sarah Jackson (for Morris 86), Courtney Ashworth (not used), Zoe Griffiths (not used), Katie Doster (for Ridge 90+3). The New Saints Ladies are next due to be in action this coming Sunday (9th December) when they are at home to Barnsley Ladies in the FA Women’s National League Plate 2nd Round. However, at the time of posting this report, the likelihood is that it will be played at Four Crosses FC’s ground at Foxen Manor (weather permitting). Please check on the TNS Ladies official Twitter account (@TNSLFC) or ring 07719 954727 to confirm the kick off time and any possible change of venue. The next scheduled league game is scheduled to be at home to Nettleham Ladies at Park Hall Stadium on Sunday 13th January with a 2.00pm kick off.